This is what it looks like from out our front door. The boys love it! And we are supposed to get more. I don't mind it, I just hate driving in it. This year I found this cool Christmas card tree! I love hanging all the cards up on it. It's a fun way to display all of our cards. 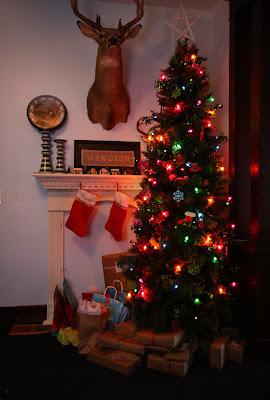 This is our little Christmas corner. Of course, the tree is colored lights....you just have to have colored lights when you have kids (well, my kids anyway). Slone has been coming home with little handmade ornaments from Sunday school and preschool. It's been fun adding them to the tree as we go. There's also the presents. Slone and Bo both got to go shopping at Santa's Secret Shop. They cannot hardly wait until Friday! Oh, we also had the addition of our temperature gauge that was added by Matt. Supposedly, the perfect spot was on top of the candle stick. Hope you have a Merry Christmas! I'll be back with pictures from Christmas morning! !